App installation rates are one metric by which to measure popularity, but there's another: daily active users. This refers to the number of app users who — you likely guessed it — open the app every day. About 60 percent of the folks who have downloaded "Pokemon Go" are daily active users, giving the app a three percent daily usage rate. That's pretty good! Considering the game's addictive nature, those numbers are about what I expected. So what makes "Pokemon Go" so popular, and why are people leaving their houses in droves to catch whatever Pokemon luck might put in their paths? In my opinion, it all goes back to the sense of adventure and possibility that drove the original games and anime series. In the anime, Ash Ketchum leaves home to become a Pokemon Trainer. He travels through cities, forests, and caves; meets other Pokemon Trainers who become his friends; and, of course, has plenty of exciting battles with Pokemon (both the wild kind, and those who belong to his opponents). It all goes back to the sense of adventure and possibility. When I walk down the streets of downtown Richmond where I live, tracking an Eevee or a Goldeen, I feel the excitement that I first felt when I slid the Pokemon Red cartridge into my GameBoy and ventured into the woods outside of Viridian City. I didn't know what lay ahead, but I was certain it would be full of thrilling battles. Except that was something I did alone. Sure, the game allowed me to trade Pokemon, but I didn't know many other people who played Pokemon games (I went to an all-girls school at the time, and Pokemon was decidedly uncool, so I had to wait for the holidays so that I could trade with my cousins). 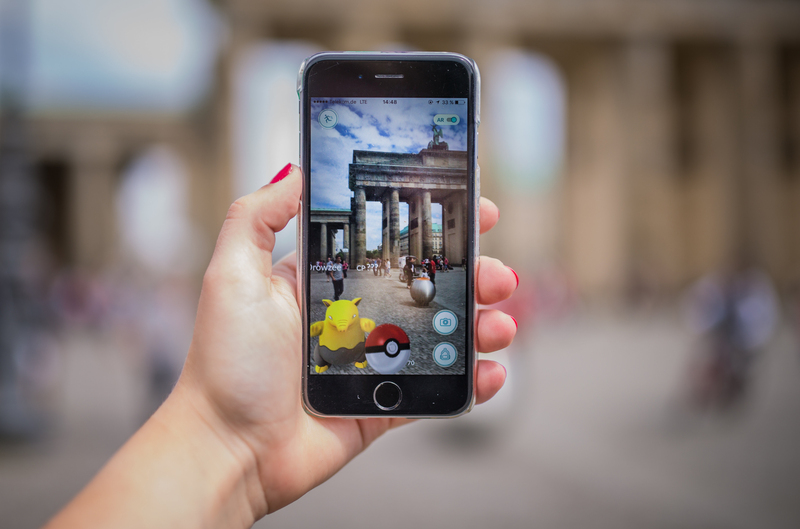 Although you wouldn't expect it by looking at the game's mechanics, "Pokemon Go" is a social game that encourages interactions with fellow players. After all, when you've got your phone in front of you as you walk, and you're waving it around like you're dowsing for water, everyone else who plays the game knows exactly what you're doing. I can't count the number of slightly embarrassed smiles I've gotten from other players as we've passed each other. Here's another example: a few days ago, I was sitting at a coffee shop, drinking a latte and doing some work. I had the "Pokemon Go" app open next to me, and I'd periodically check it to see if any Pidgeys or Rattatas were in range. Once, though, I glanced down at my screen and saw that there was a Scyther close by — really close. I went outside, only to see a group of strangers wandering around in a stand of sunflowers around the corner from the coffee shop. "Dammit!" one of them yelled. "Are you guys playing 'Pokemon Go'?" I asked them. "Yeah, and we're all trying to catch this Scyther," another one said. So we all set to work catching the Scyther, cheering each other on as each person landed it. It was a gorgeous day, and the sunflowers were taller than we were. When the group was finished, they asked me to take a picture of them. So I did, and as all of us were laughing and smiling, I asked if I could take one on my phone, to memorialize the way we'd all been brought together in that moment. I have never played another game that's brought me together with strangers in such a positive way. Even when I've been at comic and game conventions, surrounded by other people with the same interests, it hasn't happened in quite this way. Not only do '90s kids get the chance to make their dreams of Pokemon Trainer-hood come true, but they get to do it with thousands and thousands of other people. It's a bizarre community, but that doesn't make it any less valuable.